I adopted a dog aka "uh oh, what have I done???" Rory in the first week home! Currently in my home I have 2 adopted dogs, 1 foster dog and 2 rescued cats for a total of 5 animals that all get along. At this moment in time my home is a fairly well-oiled machine, we have our routine, everyone gets along and respects each other's space, and we are all pretty happy. BUT we did not get to this place easily, and with every dog and cat that has come and gone from my home, there have been struggles, obstacles to overcome, and an abundant need for patience, commitment and faith. All too often I see dogs being returned to a rescue or shelter after ONE DAY! Or a week. I'm not sure what people are expecting but I am here to share the truth. Adopting a dog, in the first days and weeks and sometimes even months, is VERY STRESSFUL. But if you stick it out, there is hope, there is reward and there is a lot of love. This blog is just sharing my personal experiences and I would love to hear yours in the comments! When I adopted my first dog Rory, who is now almost 7, many tears were shed in the early days. The feeling of uh oh what have I done was overwhelming at times. Rory had been picked up as a stray and was about 7 or 8 months old. She was unspayed and she was pregnant. I loved her the minute I saw her. The rescue spayed her and terminated her pregnancy which was very early along and by the time she came home with me I think her hormones were way out of whack and frankly, the dog had issues. She immediately showed signs of being very territorial with strangers visiting the home. She was horrible with the cats who took to the basement in fear. She was hit or miss with my parent's sweet old lab Sydney and she was guarding her space. She would bark in the middle of the night. She challenged everything I asked her to do. It was tough! I adored her but I felt very overwhelmed and I questioned whether I had made a mistake. I remember specifically crying to a friend about it over a cup of coffee and that was six years ago! But we stuck it out. After a few weeks went by, she stopped chasing the cats as much, she was nice to Sydney on a consistent basis and they became buddies, we got into a routine, she got used to being gated into her space at night and stopped barking, and the guarding behaviors quickly went away as she trusted me. We bonded and she started to respect me as the boss and as the weeks and months went by and our bond got stronger and stronger, I knew that adopting her was the best decision of my life. A few years later I adopted Cy and although he was a senior and fairly calm and he and Rory liked each other immediately . . . I still had many uh oh moments and big concerns about whether this was going to work. He was very intense around the cats even slamming right into the glass screen door trying to get at one of the cats. I was not taking any chances . . . the cats moved downstairs temporarily and they lived separately for about a month but obviously aware of each other's presence in the home. Slowly we added some time in the same space while on leash and with lots of treats and rewards for dogs and cats to keep everyone happy. Then we added some free roaming times with gates. Then we built up a strong stay (always with a leash on) and Cy was frankly not even allowed to look at the cats. Once he got used to them moving around while he was in a stay things got really easy. I will never forget the day that Jake my oldest cat felt confident enough around Cy to walk up to him while he was in a stay and things were pretty much smooth sailing from there. As much as Rory and Cy hit it off from the get go, they had a couple of little squabbles in the early days that left me feeling worried and having a couple of sleepless uh oh nights. The fact is, where there are multiple dogs getting used to each other, there are probably going to be squabbles. Where there are dogs and cats getting used to each other, there is going to be chasing and barking and hissing and growing pains. Where there is a dog who has been in a shelter for a long time, there will be confusion, maybe some resource guarding, and some other unwanted behaviors that will probably settle down once you get over that 3 month hump. There will be house-training issues, counter surfing, and shoe eating. Rescuing animals can be stressful business but if you hang in there, take things very slow and make the commitment to get over the hump, after 3 weeks you are going to see a big difference. And after 3 months you will probably be feeling pretty relaxed about your new family member and head over heels in love. If you are not up to the challenge of what is being described above, and you are not open to possibly working with a trainer if needed, you probably should not be bringing a dog into your home. Please consider a cute stuffed one! The day Jake felt safe enough to approach Cy. I have a new foster dog. His name is Charming. As a volunteer at a large municipal shelter, it is my great joy in life to meet and get to know hundreds of dogs. Some I get to know better than others. And some I see and hear about from other volunteers and staff, that really need to get out of the shelter for various reasons. Some dogs have an easier time being at a shelter and becoming institutionalized essentially. But all need love and it affects them in different ways, physically, emotionally and behaviorally. The stress and loneliness can be too much for many. Charming is one of the many dogs I have spent extra time with, often at off-site adoption events where I might spend 5+ hours with group of dogs, usually having one or two I hold on leash for hours, talk to, cuddle, introduce people to. Or sometimes I see the dog with another volunteer and I can just watch them in action. What impressed me about Charming is that he was very relaxed around everyone he meets. Small children too. I watched him the first day I met him licking the faces of two other male dogs he just met, also up for adoption. He didn't show any possession over toys. He took treats gently. He didn't get over excited. He sometimes rolled on his back for a good belly rub and a stretch. I also found out how he jumps in the kennel at the shelter, banging his head on the bars at the top. This boy can jump! And he was so incredibly stressed out that the only outlet for his energy was to jump and jump and jump. I saw the scabs and wounds and scars on his head, and knew this guy really needed out of the shelter. I also found out he had been in the shelter since last summer when he was found as a stray at about 10 months of age. I had the pleasure of holding him on leash for the majority of the day at an outside event on the Upper West Side of Manhattan in front a pet store. There were 4 dogs in total outside and several cats that spent the day inside the store in cages. Charming was incredible. Sometimes events can be stressful for dogs, especially for an isolated suburban shelter dog at an event on a busy Manhattan street! Charming really loved the city. Twice I took him for walks and once another volunteer Lori and I walked him up to Central Park, on the first nice day we had after the brutal winter. The park was covered in people on blankets, people biking and running by, horses walking by! Charming loved it, was very relaxed, took it all in. On the streets he walked easily by other dogs. The only thing confusing him a lot was that the trees on the streets all had little gates around the tiny grassy areas and he didn't know where to pee. Suburban dogs rarely pee on concrete! The other thing that happened a lot that day is that I had to explain to people why Charmings head had all those scabs and wounds on it. A lot of people thought that they were cigarette burns. I am very excited to be starting a pit bull rescue called Get A Bull with my my fellow animal rescue friend and it was on that day that I knew we had to get this guy out of the shelter. At the same time, my eldest dog Cy was sick and I knew I wanted to get a foster dog as soon as possible but I also knew that it wouldn't be fair to stress out a dying dog by bringing a foster dog into the house. Just a few weeks later Cy was gone. I grieved for a week, saw that my two girls were doing pretty good despite a couple little signs of grieving for a day or two, and 10 days later I brought Charming to the house, ten months after he first arrived at the shelter. 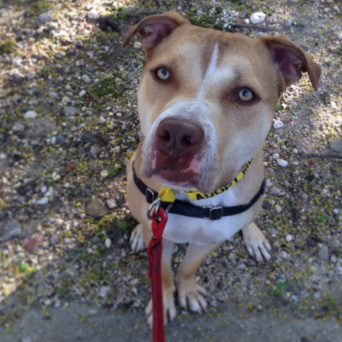 Charming is very much a foster dog and there is no possibility that I would be keeping him. I say this because everyone asks me that! I think he's a loving, good natured, beautiful dog that is going to make the right family very happy and he is in my home because I am trying to help him. He is doing very well after a week here, really exceeding all my expectations. The rest of my pets, especially my dog Rory, is not ready to have him integrated into the family, and she may never. Cookie I think would love to wrestle with Charming all day but we are taking things slow. Charming is way too interested in chasing cats to live in a home with cats. I have two cats. Charming has a guest room that is all his. And he spends most of his time in that room, sometimes in the crate with the door open and sometimes loose with door closed. When I take him outside quite a few times a day, I walk him through the house on leash and then he does his business and sometimes runs like crazy in the backyard. He has a beautiful run! I sit with him on the screened in porch. We take a long walk together first thing in the morning before work. He chews on a lot of stuffed kongs to keep him busy, bully sticks and nylabones. Sometimes he'll cry for a couple of minutes when I leave him but he stops very quickly. There are definitely a couple of training issues to be worked on including mouthiness which has already improved and basic obedience, but he is a pretty kickass houseguest, he has had not one accident and he sleeps quietly through the night in his crate which is the best! My heart swells with joy to know that Charming will never see the inside of an animal shelter again. Charming is almost 2 years old and will be available for adoption soon via Get A Bull. He is a pit bull/hound mix with incredible eyes. He is located in Long Island, NY. Email getabullrescue.com for more information. I've had dogs for years, my whole life really, and have always heard about the dangers of feeding rawhide to them. Rawhide is not digestible because it includes lots of added fillers and binding agents and most rawhide is made in China making it fairly dangerous in terms of contamination. Also it can be a choking hazard. That said, the appeal of the rawhide is of course, keeping our dogs mentally busy and occupied and also chewing is good for their teeth. Walk into any drugstore or supermarket and they sell a lot of cheap rawhide products and I don't recommend it. So when I would hear people speak of bully sticks, I immediately lumped them in with rawhide and never even considered giving them to my dogs. Fast forward to the bad weather of this winter and living with 3 crazy dogs needing an outlet for their energy! I live up on a hill and it's been a snowy icy prison this year, despite having a yard. My dogs need to get out, off of our property, smell things and burn off some energy so without a walk it can sometimes get annoying. I had heard mention of bully sticks from the founder of a rescue group called Unchained New York, when I asked her what supplies they were really in need of. I have been volunteering with this rescue group for a few months now and it has been life changing. 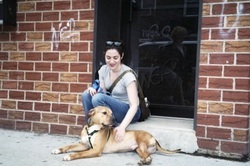 "Unchained New York's mission is to improve the quality of life of chained and neglected dogs through community outreach, education, rescue and advocacy." (That is a topic for another time!) Bully sticks are especially needed to keep these dogs busy both when they are stuck in the hell of living outdoors but also when they are brought inside, to keep them occupied and out of trouble. So I began researching bully sticks and discovered there is a big difference from rawhide. Bully sticks (for the most part) are 100% dried meat (actually they are made from bull's penises, gag I know, and I am a vegetarian and don't even wear leather!) They are far more digestible in dogs systems than rawhide (rawhide just passes right through) and they last a very long time! I found a couple of brands made in the USA, one in particular and immediately ordered a bunch for the Unchained dogs but also stocked up for my own dogs. Bully sticks come in all sizes but I buy either the 9" or 12" ones but there are smaller too depending on your dog and even larger ones. They also come in varied thickness. They are not cheap, at all, I have found some great sources online to buy in bulk. If you buy them in the store you will go broke. I buy them from and they are often on sale at chewy.com. right now they are a case of 35 of the 12 inch size for $119.99 and fast free shipping. They have a case of 35 of the 7" ones too for $69.99 and so on. There are many size and price options. These are made from free-range, grass-fed beef. 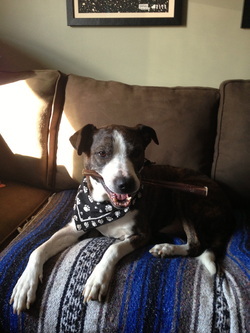 I have also purchased from bestbullysticks.com. Looks for coupon codes for bestbullysticks.com online and make sure to click on the Made in the USA menu. Chewy.com never has coupons. One other thing to keep in mind is the caloric content, it can be high and they are high fat! So consider this and don't overdo it. Truth be told, Cookie got a little chubby this winter so I think I am going to buy a smaller sized bully stick to have around for her, and she's on a little diet! I also give my dogs digestive enzymes daily which really manages their gas and helps them digest! There have been many days this winter, around 2 or 3 PM, that if my dogs didn't have a bully stick to chew on, I would have lost my mind. I work from home and I can't get anything done if they are barking; like if Cookie is chasing Annie Cat or if Cookie and Rory are wrestling and rolling around non-stop (with sound effects) on the rug behind my desk. They are very expensive and so the rule I made was definitely to only feed them to them when there is a serious need to manage energy. On days when we have a good walk in the morning, I almost never give out bully sticks. I usually don't need them on weekends. So usually 3X a week. My other rule is to never ever feed them to the dogs when they are unsupervised god forbid they choke and of course with multiple dogs, just in case there is a battle over possession. Luckily my dogs have shown respect to each over their sticks but if you have a multi-dog house, definitely separate them into their corners and be sure to tell your kids to steer clear just in case. Rory always finishes hers first, can take anywhere from 30-60 mins depending on width and the day, Cy is second taking from 45-90 minutes., and Cookie once took almost 3 hours! Aaaah. Cookie is a smaller dog but also the troublemaker so I am glad to keep her BUSY. However sometimes Cookie will get up after a long time to get some water, which is when Rory always moves in and takes it, and Cookie at that point shrugs and moves on. Oh and when they are done chewing on their sticks, guess what they do? They sleep! Ah yes, it's nap time and I am a happy dog mama. A final benefit of feeding bully sticks or similarly a stuffed kong or other busy toy or treat is to give them out if you have a dog that is stressed with a contractor or someone doing work at your house or any other reason your dog might be stressed or barking at your home (while you are home.) They can be a life saver. When we bring bully sticks to the chained and penned outside dogs, they usually get pretty excited and this amazing dog Bebe immediately buries hers in her straw for later. Some take them into their igloos or houses and hide them inside in the back. Just thinking of them enjoying their sticks when they are alone or cold, helps me sleep at night. 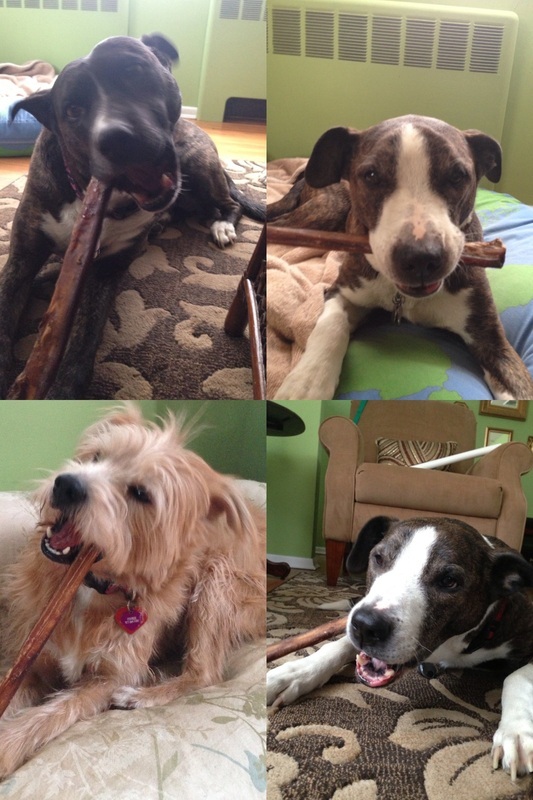 Consider donating some bully sticks to a local rescue or outreach group in your community. That is the tale of the bully stick. It really has made for a much happier winter for all of us. 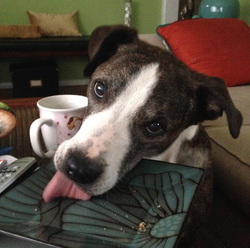 Since the name of the blog is "I Have a Pit Bull" it probably makes sense that I tell you about my dogs. Yes, I have a pit bull, two in fact. Although really, like many pit bulls, while people look at them and say "pit bull," the truth is, they are mixed breeds, mutts even. One of my favorite TV shows of all times is "Gilmore Girls" a beautiful and quirky series about the bond between a mother and a daughter. On the show, the mother and daughter have a tradition where every year, on the daughter Rory's birthday, the mom, Lorelai, tells Rory the story of her birth. I do a similarly weird thing, where I like to tell my dogs (yes I talk to them) the story of how they came to be mine and of the first time I saw them. And so it will not surprise you that the first dog I ever adopted where I was the mama (not a family dog), I named Rory. Here she is pictured about a day or two after coming home. I first saw Rory in the month of October, just one month after a devastating breakup with my boyfriend. I had moved out from his apartment and was living with my parents, sleeping on a blow up bed in the basement. To call me fragile at this point in my life was an understatement. I had been volunteering for many years and walking dogs every Sunday with a group called For Our Friends. That Sunday I was told people were bringing by a dog they found as a stray. She had been living in their basement for a couple of weeks. They said they tried to keep her but their dog was not accepting of her. They pulled up and this little brindle dog hopped out of the car, very serious looking, not more than 40 lbs. We did our usual evaluation and determined that we would take her. They called her Brownie. She was about 7 or 8 months old. I took her for a little walk and already my head was planning and plotting if I could take her home. Keep in mind I had been working with dogs for years but this was the first one who had me really seriously thinking. I think the timing had a lot to do with it and also maybe a little bit of fate. I had two cats at the time, was living at my parents house as I said, where we had a senior dog, a labrador retriever named Sydney, who was 9 years old at the time and my parents had a cat as well. I decided I would take it slow but first things first, I asked the president of the rescue if we could call her Rory and to my excitement, she said yes! That day as I put her into her cage, she fought me like crazy although never tried to bite, and I said goodbye until the following week. I remember the second week I met her, this one male volunteer had taking a liking to her and was walking her all week and he came that Sunday. He remarked about how smart she was and how she seemed to listen to people when they talked and I watched and saw that he was right, as people spoke to each other her eyes would dart back and forth to the person who was speaking. And her ears would stand up and move like antennas. Finally I was able to get agreement with my family to bring her home. She was spayed and vaccinated and she was ready to go. My Dad came with me to the animal hospital where we picked her up. I will never forget that day, me and my Rory riding in the back while my Dad drove. From there well there were many ups and downs with my girl, months of getting her not to chase cats, lots of training, quite a few tears, but mostly love. She and Sydney bonded quickly and were good buddies until I moved away. Now Rory is 5 and she will always be my baby girl. 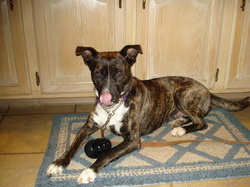 She is super smart, alert, sensitive, affectionate and very obedient at home but is a fearful dog out in the world. I will definitely post more about Rory's challenges in another blog. But I accept her as a whole, just as she accepts me.